This is old version Google Calendar 5.5.12-127519458 apk for Android, you can install it if you want to downgrade or install old app. It is top Productivity apps from Google Inc..
With this app, you can create schedule from today to several time ahead. Each of notes on timeline is able to connect with additional information such as website, picture, video, link, etc. New Google Calendar is completely different from first version. Since Android become major operating system in mobile device, Google puts many upgrades on this app. You can see attractive and interactive appearance that makes you easy to access every feature. It has event feature that let user to connect with friend or family. You do not have to worry about giving invitation on special event for friend or family that lives far away. By using social media integration, user can post his or her party invitation quickly and easily. Calendar can be excellent app for personal reminder. This thing is very crucial if you are person in important place. 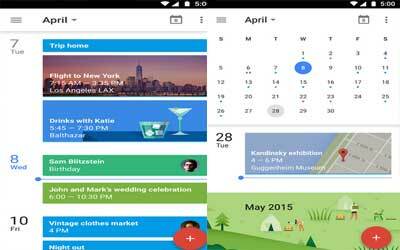 Google Calendar for Android is the best friend that help user take care every day activities. (Google Apps for Work and Education only) Find a time – Add colleagues as guests to your event and let Google Calendar find the best meeting times for you.